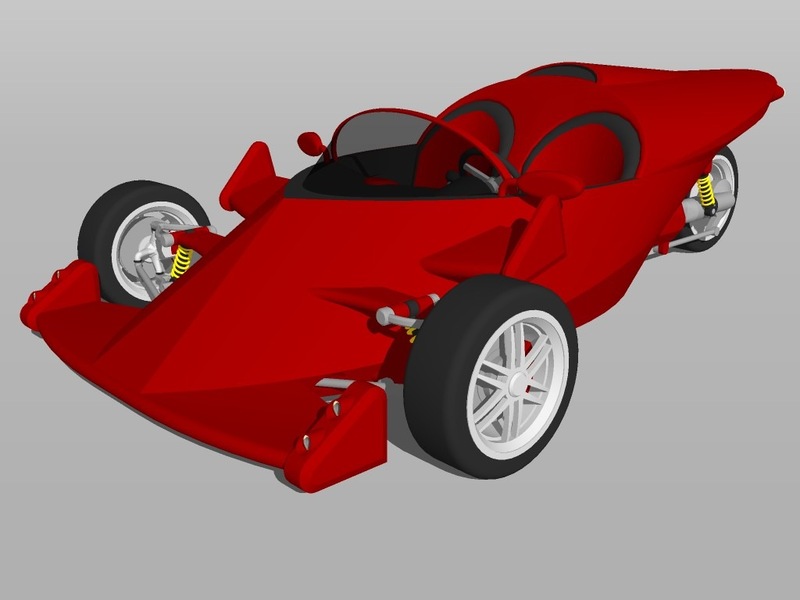 Home » SketchUp » Category "SketchUp 3D Challenge"
My entry for this challenge (F1 Inspired 3-Wheeled Roadster) is a 3-wheeled lightweight roadster designed for high performance yet economical. It would be powered by an Inline 4 cylinder gasoline engine (likely a large motorcycle engine with a lot of torque). It would be constructed of all lightweight materials including fiberglass and carbon fiber to keep it below 900 pounds to maximize performance and fuel economy. It features independent double wishbone suspension on the front wheels and a paralever arm suspension/drive train combination on the rear wheel. Based on a similar design, you could expect upwards of 180 horsepower, a top speed exceeding 150MPH and experience 0-60MPH in less than 4 seconds. No fancy 3D rendering has been used for display, just pure SketchUp goodness. After taking a long break from competing in the Google SketchUp 3D Challenge I decided to give it a go with Challenge #102 – Public Transportation. I just looked to see how much time has gone by since the last entry into the challenge and I was stunned to see that my last entry (#88 Skyscraper – Mile High Tower) was submitted July 9, 2009. That was 362 days before I submitted this one on July 6, 2010; almost a year! Usually I post something on my blog about the challenge right after I finish my model but this time I am posting after the winner was determined. I am happy to say that I am the winner of the challenge making it my 8th win. For this challenge I decided on making an electric bus. My inspiration came from a few concept buses I found online but in the end I came up something unique. My entry is entitled “Solocraft Electric Bus”. Just in case you are wondering, “Solocraft” is the fictional brand name I use for any vehicle I create for the challenges. The name comes from Han Solo from Star Wars. It is designed to be small and maneuverable for tight city streets. Instead of relying on overhead wires this one gets its power from the Lithium ion batteries contained in the front and back drive module units which would save on infrastructure costs. It would be very lightweight to provide for a decent amount of battery range. The most unique feature of the bus is the way in which it steers. There is a 4 wheel drive module at both the front and back of the bus. Each module rotates on its own 360 degree axis. This allows the bus to not only make very tight turns and the ability to turn on a dime but it also enables it to rotate the drive modules 90 degrees and pull up to the curb laterally. The floor is at the same level as a standard city curb height in the middle for easy no climb access to the lower level seats. The floor height also accommodates wheelchair users like me without trouble at the specifically designed bus stops the bus would use. When the bus parks at regular bus stops or on flat pavement a ramp concealed in the floor also provides for wheelchair access. I had planned to push this model further by creating an attachment that would turn it into an airplane for short distance air travel but I had to abandon that idea as I ran towards the deadline. Sometimes my ideas are just too ambitious to complete within the allotted time. You can see what happens when I don’t have a deadline for a project if read about my Starship Project on this blog. I plan on implementing the airplane idea as well as a few other ideas that would extend it’s versatility after I finish the starship. This submarine is modeled to resemble a fish. Its propulsion system features large propellers contained in ducted cowlings that are designed to create a vortex enabling the sub to travel at high speeds through the water. Each propeller housing is attached to a wing that pivots up or down to ascend or descend in the water. When the wings move in opposite directions they allow the submarine to roll and turn much like an airplane does. Varying the speed of each propeller also assists in turning mobility. Take a look at the gallery below or download the model. This week’s challenge was difficult because we had to recreate a well-known work of art in SketchUp. I chose to do Edward Hopper’s Nighthawks oil painting. Big mistake as it turns out. It’s looks great as a painting but if you go trying to recreate it in 3D and take care in dong so, it is practically impossible. It’s just that the physical perspective of the painting does not translate to any form of reality. If I was recreating a photo, then no sweat, but a painting isn’t a photo, it’s an impression of someone else’s perception of something real. Had Edward Hopper traced a photograph onto canvas it would have made it easier but that’s not his style. I didn’t have enough time to add all of the details and definitely not the time of the capability to model the people. To match the painting perfectly I would have had to put way too much work into it. Did I do it justice? You be the judge. For this challenge I designed a two-seater two-wheeled car. It balances on its two parallel wheels in the same fashion as a Segway scooter. The vehicle is driven by 2 large efficient electric motors (one for each wheel) allowing one wheel to move independently of the other allowing for greatly enhanced maneuverability. The car is powered by either the solar cells in the roof during the day or by the hydrogen fuel cell in the floor during the night or other low light conditions. The large wheels surround the entry doors which open by rotating backward on an offset axis allowing for a spacious opening. It is designed to have a minimalist interior free of a cluttered dashboard. In place of the dash is a large translucent view screen that rises out of the floor when the vehicle is on. The view screen provides area to display it’s virtual gauges as well as controls for the navigation system and media player. The vehicle is controlled by two joysticks on the armrests of both seats. Both passengers have the option of driving the vehicle with either the left or right palm joystick and controlling the rest of the car’s functions with the opposite joystick. There is also a generously sized cargo area in the back that expands for additional space when needed. Take a look at the gallery below or download the model for a closer look.